Live it Up on The Party Boat in Lake Tahoe! There is no better way to let your hair down than living it up on The Party Boat in Lake Tahoe. With the sun still shining and beautiful summer in Lake Tahoe still hanging around for a little longer, The Party Boat is calling and we would be fools not to hop on board! Nothing ends summer with a bang like this Lake Tahoe boat ride with a kick! Whether you are in town to celebrate a wedding, or just want to take a Lake Tahoe boat ride with your friends, The Party Boat is the best way to experience the beauty of the Lake Tahoe. Private charters, wedding cruises, corporate events, or any big milestones are perfect excuses to celebrate on The Party Boat. The party takes place on a beautiful 52’ Harbor Master that can accommodate up to 49 guests. The captain and crew can work with local businesses, such as photographers, bakeries, and florists, to help plan whatever your event vision might be. The Party Boat drops anchor in the pristine Tahoe Keys Marina. The boat features include indoor and outdoor decks, a fly bridge, two bathrooms and a full kitchen. Everyone knows that Lake Tahoe is a magical place to celebrate a union. But imagine declaring your love surrounded by the pristine wonder, it the lake. The Party Boat has year-round availability, and couples can plan their weddings according to specific needs. The Party Boat Lake Tahoe can provide wedding rehearsal dinner, or spouses-to-be can use their own caterers. The Party Boat has a $150.00 fee for bring-your-own food/beverage services. Crank up the music and dance away any cold feet on The Party Boat Lake Tahoe. Ideal for bachelor/bachelorette parties, The Party Boat can accommodate many different needs for the perfect party, so brides-and-grooms-to-be can really live it up before biting the bullet and getting hitched! Whether you are planning a relaxing afternoon with the girls, or a hoppin’ party with the guys, The Party Boat in Lake Tahoe is able to put together the perfect end of single life celebration. Corporate Events, Family Reunions and More: No one can complain about long meetings, or too many cheek pinches from aunt Silvia when riding on The Party Boat in Lake Tahoe. 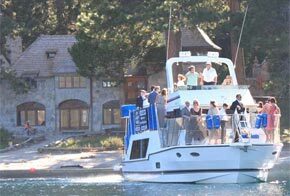 The Lake Tahoe Party Boat can accommodate pretty much any event, be it a corporate get together, a family reunion, or just a birthday party. Private charters take groups of friends, family, or coworkers out for a day to remember on Lake Tahoe. Everyone will be talking about the outing for a long time to follow as the Party Boat glides into nothing but fun.